This isn’t ITSM, but it’s a lovely example of a simple, quick idea that delivers real value. My home town of Reading is served by a pretty good local public transport network. A number of its modern, double-decker bus routes serve the town’s Railway station, a major national rail interchange. However, this is Great Britain, where almost every piece of transport infrastructure is run by a different company to the one next to it. They are not well known for working well together, and services and information are usually very disjointed. These screens on Reading’s buses predominantly show advertising. Recently, though, as buses near the railway station, this screen has begun to appear. 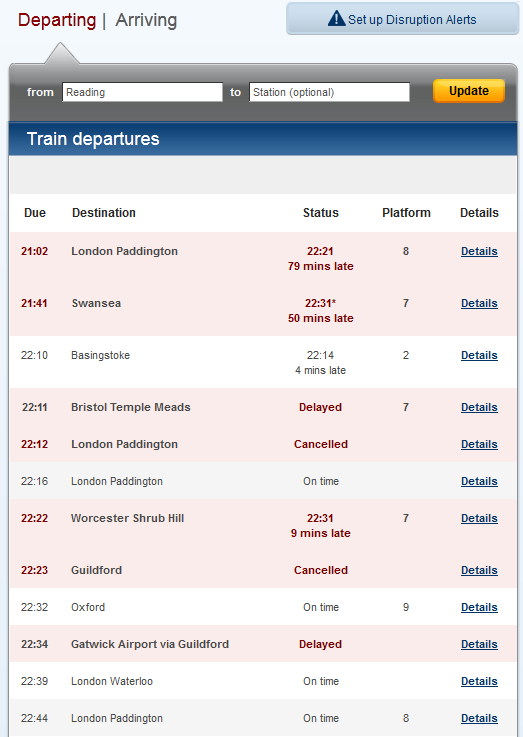 It’s nothing more than a quick, realtime view of upcoming train departures, something that can be sourced from the National Rail website. It’s a simple but clever idea, probably relatively straightforward to implement on a wi-fi enabled bus (I told you we had a good bus network!). Reading is a commuter-town, and now we know about the status of the service before we’ve arrived (which can be important on a day like today!). We know whether we have time to grab that coffee, or whether we need to rush for the next fast train. This speaks to me of a company that has really thought about its customers. It puts valuable information right in front of the the people who need it, at the precise moment they need it. Simple, easy, and very effective.